Die casting technology is one of the mainly applied manufacturing practice In the die casting process the molten metal is injected under pressure into the hardened steel dies. Different casting processes require the alloy to have different casting characteristics. We will define here the different casting characteristics of die cast AL- Alloy. Cast ability is the property of an alloy to be cast without formation of defects such as cracks, segregations, pores or mis runs. Alloy dependent the phenomena that determine castability, fluidity, macro segregation, hot tearing and porosity. Cast ability of aluminum alloys can also defined such as solidification path, dendrite coherency, solidification shrinkage and inter dendrite permeability. The influence of alloy composition on fluidity, macro segregation, hot tearing and porosity will be described. coherency, fluidity, permeability and shrinkage will be presented. Aluminum die casting alloys are lightweight, offer good corrosion resistance, ease of casting, good mechanical properties and dimensional stability. Although a variety of aluminum alloys can be die cast from primary or recycled metal, designers select a standard alloy listed below. A360 — Selected for best corrosion resistance and pressure tightness. A380 — The most common and cost effective of AL- die casting alloys. Provides the best combination of utility and cost. A383 & A384 — These alloys are a modification of 380. Both provide better die filling but with a moderate sacrifice in mechanical properties such as toughness. A390 — Selected for special applications where high strength, fluidity and wearresistance and bearing properties are required. A413 (A13) — Used for maximum pressure tightness and fluidity. The following table will provide a general idea of the differences in different Aluminum Die Cast alloys. This table will help us technical comparison in Al. alloys. Temperature of the metal and die. 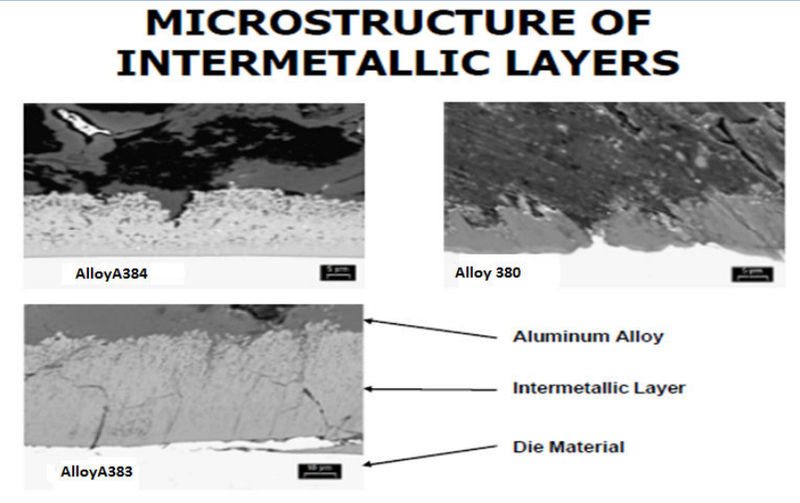 Nature and constituents of casting alloy and inter metallic layers. Nature of the die and operating parameters. EFFECT OF VARIOUS ELEMENTS ON THE INTERMEDIATE LAYER THICKNESS. The effects of alloy composition on the die soldering for the A 380 type alloys and effects of some key elements on the growth of the intermediate layer between the tool steel surface and the soldered Aluminum. etc. and having high melting temperature and high specific gravity. With an increase in cooling rate, the size of the sludge particles and the volume fraction of sludge decrease,Sludge formed at the low cooling rate as large platelets, and polyhedral particles. At the high cooling rate, SLUDGE is in the form of platelets and star-like particles. 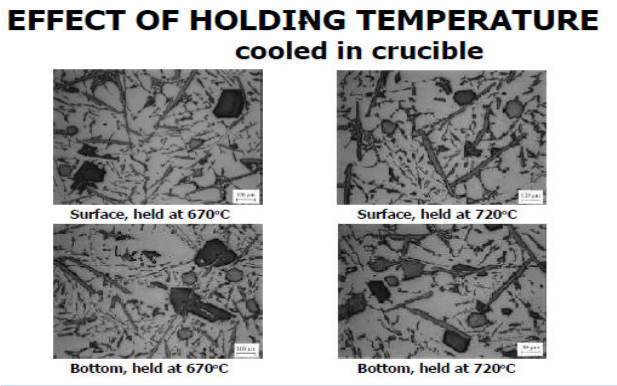 When the alloys solidify at low cooling rate, holding at 670 °C and 720 °C does not affect sludge formation. When the alloys solidify at high cooling rate,more sludge was found in A380 alloy afterholding at 670°C. In 380 type alloys, the sludge phases are mainly Fe-rich compounds consisting of Al, Fe, Mn, Cr, Ni. Alloys with higher SF have a higher tendency to form sludge and form larger volume fraction of sludge. 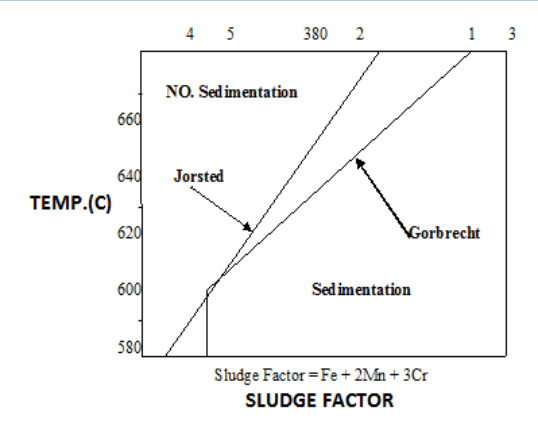 The morphology of sludge is influenced by the Fe:Mn: Cr ratio and by the cooling rate.Slow cooling favours formation of sludge. 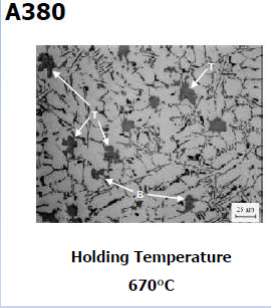 Holding at 670°C (~1240°F) and 720°C (1328°F) does not affect sludge formation in all the alloys solidify slowly. When cooling fast, more sludge formed in A380 alloy after holding at 670°Cthan at 720°C. Fluidity is a material’s ability to flow into and fill a given cavity, as measured by the dimensions of that cavity under specific conditions. The length of molten liquid metal that can flow through a given mould before freezing Fluidity is heavily dependent on heat flow during solidification. Fluidity of Al- Alloy depends on lubricant coatings, alloying additions, head pressure, and temperature of molten metal. Alloy chemical composition play a important role in die filling that is the fluidity of molten metal. Alloying Elements that lean to form high temperature compounds, e.g., Fe, Mn, Cr, and Mg, tend to decrease fluidity.